A simple left turn whilst learning to drive or during a driving test can have many potential hazards, from tight turnings, badly parked cars, or cyclists and pedestrians that could be crossing your path. The driving test will of course involve many left turns on a variety of different roads. It’s important that the correct rules are taken, not only for safety reasons, but to successful pass the driving test. 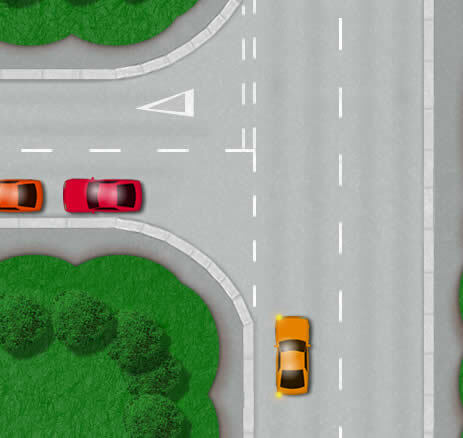 This tutorial explains the correct procedure for making left turns along with road signs that may be encountered and the potential hazards that any driver may experience. Locating a left turn at the earliest opportunity will provide you with much more time to prepare for the turn and to perform it safely. Keep a an eye on left turn ahead warning signs, if a sign isn’t present however, look for gaps in trees, houses, hedges or parked cars that may suggest a left turn is ahead. Once you have located the left turn up ahead, look into the interior mirror, followed by the left door mirror. You will need to signal to the left just after checking the mirrors. The position of your car depends on the width of the left turn and the width of the road you are currently on. If the width of the left turn you intend on taking is narrow, you may need to position your car further to the right before taking the turn. This will allow for a wider turning angle and avoid hitting the kerb or mounting the pavement. 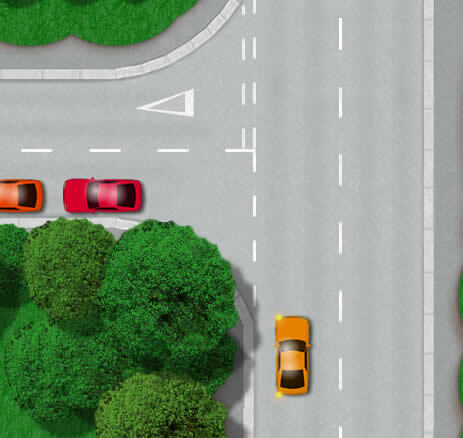 If the road you are currently on before taking the left turn is reasonably wide and the left turn is reasonably wide, position the car to the left side of the road. Left turns are usually taken in 2nd gear at around 10-15 mph. If the left turn is very narrow and closed, 1st gear at around 5 mph may be required. Before taking the left turn, a final check in the left mirror is required and possibly the left blind spot in case of cyclists. Just before making the final left turn, check the left mirror and if unsure, also check the left blind spot for cyclists, especially in busy areas. See image for example. Prepare for any hazards upon taking the turn such as pedestrians crossing the road just as you are about to turn and cars parked closely to the junction. Just like T-junctions, a left turn can be closed and difficult to see what is around the turn. Accidents can easily happen if you are not well prepared. As the driver, you should always give way to cyclists and pedestrians crossing the road, even if it means stopping in an inappropriate area. Try to establish as early as possible if the left turn is closed (blind) or open (clear). See images above for an example. Accidents can frequently happen when drivers make a left turn that is closed and they are driving too fast or under-prepared for any hazards. A closed left turn can be difficult to see around due to trees, hedges or fences. If the left turn is closed and narrow, you will be required to slow the car down to an appropriate speed and gear. This is often 1st gear and around 5 mph before taking the turn. Observation is important as you approach the left turn. You must use the appropriate gear and speed, but you must also prepare to give way to pedestrians, cyclists and hold back due to parked cars near the junction. If the left turn is narrow, you will need to take a wider turning angle (keeping further to the right before making the turn). This will avoid you hitting the kerb and entering the left turn on the wrong side of the road. Try to locate the turn as soon as possible by use of signs, road markings or gaps in trees and houses. Use the MSPSL (Mirror, Signal, Position, Speed and Look) routine on the driving test. Establish if the left turn is open or closed so as to decide an appropriate speed and gear for making the turn. Take a final check of the left mirror before making the turn in case of cyclists. If the turn is narrow, take it wide so as to avoid hitting the kerb, mounting the pavement and you must try to avoid entering the left turn on the wrong side of the road. 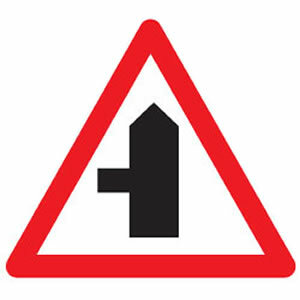 Left turns are often signified by the use of road signs such as below. During a driving test, keep a keen eye on all road signs. Making a left turn into a restricted area will often a no left turn sign before. It is possible that a driving examiner may ask you to ‘take the next available left’ during a driving test. 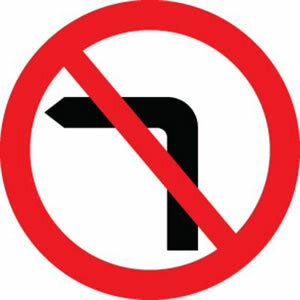 The next junction may in fact be a no entry and have a no left turn sign before. Making this turn is illegal and will certainly fail a driving test. Occasionally indicator or brake lights may fail or you may feel that other road users may benefit from a arm signal. Hi I have been reading your tutorials. One of the best websites. I am learning to drive automatic cars. My left and right turns are very bad mainly while coming out from Major road to minor road. My hand and foot coordination are not sitting properly. Could you please give me some advice as to how much to turn the steering wheel and at what speed while doing left and right turn. I keep on turning and the instructor has to tell me everytime enough turning. I do not get the judgment correct. Hello Priya, glad you have found the website useful. Unfortunately I cannot tell you how much to turn the wheel and at what speed simply because each and every turn is different. What this is, is an issue with spatial awareness (where the car is in relation to the road) and it can be linked to conditions such as dyspraxia. The only way to overcome this is by repetition and making left / right turns over and over again. Your instructor needs to find a quiet location with plenty of left and right turns where you can practice with as few hazards and distractions as possible. Help yourself by using reference points, so for example stop on your side of the road (straight road) in a normal driving position. Look where the kerb comes down the road into the windscreen and ‘hits’ the dashboard. Where ever it comes into the dashboard is a reference point. As you round a corner, this same reference point will begin to appear again and as it does, straighten the wheel. Other reference points are views you get in your left mirror; where the kerb is parallel to the car. As you round the corner, when it looks parallel, straighten the wheel. The instructor should prompt you by using increments of turns, such as quarter turn of the wheel, half turn, one turn and full lock (left/right). Keep doing this over and over, starting off at slow speeds and gradually increase your speed. After some practice you’ll be doing it without the need of reference points. Thank you for your advise. Can I find some more advise on this topic on any websites? Also is there any way spatial aware ness can be increased other than practice?. Whether other people also have this kind of issue or only me?Regards, Priya. It’s not just you; I’ve experienced other learner drivers on many occasions with this. There are plenty of resources online and exercises, but I’ve only dealt with the learning to drive aspects of this. 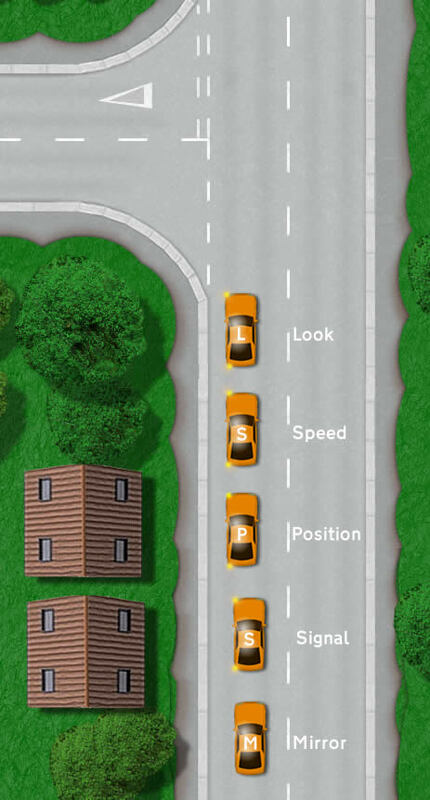 The first query is when driving how do you judge the left side of your car when passing parked vehicles? When passing parked vehicles I always get nervous that the left front of the car might hit the parked car and my instructor pulls my steering wheel to avoid hitting. For passing parked cars that are on the left, you first need to practice this with the kerb – which is one of the first things you do anyway. When parking on the left, you can use your left mirror to see the distance you are from the kerb and if it looks parallel, and you can also use a reference marker placed in the windscreen. See pulling up on the left for an example of this. Now practice the same, except driving and stopping 1 metre away from the kerb, you’ll need to alter the reference points. This is approx the distance you should be from parked cars when driving (in an idea situation). Do this on a quiet, straight road and it will help with judging distance from parked cars. The second point for bay parking also relates to kerb parking. You will know that your car is in the bay and straight by looking in your side mirrors and at the lines of the bays. When you park up on the left and look into your left mirror and see the kerb parallel with the car, instead look for the bay line. Use everything around you as reference points. You can tell when you’re far enough into the bay (not sticking out) if you use the end of the bay lines. With the help of your instructor, make a good bay park, then look at the end of the bay lines and where they line up with your car, usually with the door mirrors. Use that as a reference – see bay parking and bay parking reference points. It’s all about making use of everything around you to understand where you are in relation to it.